this helped us during WW2!! 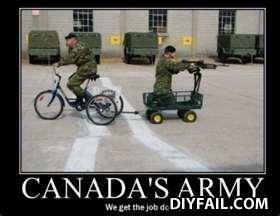 What you don't know about us is that Canada's army mostly does peacekeeping, and isn't the aggressor. By the way, the machine gun shoots popcorn for the kids.